(CNN) -- They say that breaking up is hard to do, especially when millions of eyes are there to witness every caustic comment and verbal volley. Kate and Jon Gosselin are going through a very public and contentious divorce. No one knows that better than Jon and Kate Gosselin, whose divorce is playing out on a world stage, complete with tabloid covers, he-said-she-said television appearances and court orders. Such public spats can do a great deal of harm, said divorce attorney Randall M. Kessler, who's handled several celebrity cases. "I just gave a presentation where I said, 'When can press hurt you? It's when clients start talking,'" Kessler said. "The hard thing for [famous people] to do is to not speak out, because they are so used to everything they say being quoted and helping them, but this is the opposite. Talking about a divorce is never good." Kessler has represented quite a few clients involved in celebrity divorce cases, including Tameka Foster Raymond (who is in the midst of a divorce with superstar singer Usher) and rapper Mack 10 (ex-husband of TLC member Tionne "T-Boz" Watkins), as well as some high-profile paternity and child support lawsuits. Celebrities often want to protect their reputations and the wrong sound bite can ruin that, Kessler said. Yet, at the same time, it can be difficult for the famous to take direction, he said. "They are so used to being in charge of their own destiny and being able to decide what's best for them that it's very hard for them to listen to attorneys, accountants or anyone that is trying to advise them," Kessler said. Viewers have questioned who, if anyone, Jon and Kate Gosselin are taking cues from in their very public marital battle. In May, Kate defended her husband against rumors that he had been cheating on her and stepping out while she stayed home with their twins and sextuplets. Weeks later they used their enormously popular TLC reality show, "Jon & Kate Plus 8", to admit what fans had begun to suspect: Their marriage was on the rocks. Soon they announced that they were divorcing, but would continue filming -- albeit separately -- their series, which for four seasons had chronicled the highs and lows of their family life. It all appeared to be relatively civil until Jon began stepping out with his new girlfriend, moved to a bachelor pad in New York and appeared to be living the high life with shopping sprees and designer duds. Jon took to the airwaves to reveal that he "despised Kate." Kate lamented that she missed "the Jon I knew." 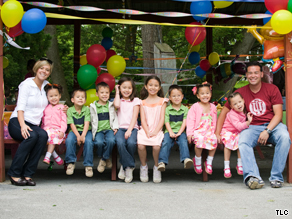 TLC announced in October that the reality show would continue as "Kate Plus 8" and Jon immediately called a halt to filming, claiming the series was doing damage to their children. Through it all, both have maintained they each have the best interests of their children at heart. Child psychologist Joanne Pedro-Carroll said the Gosselins are in a precarious position. "It's very concerning, especially given how public this is and the children's young ages, which makes them especially vulnerable," Pedro-Carroll said. "One of the things we know with really young children is that they are prone to misconceptions about the reasons for the breakup." While Jon and Kate haven't so far added a bitter custody dispute to their matrimonial melee, Pedro-Carroll said she worries about the long-term effect on the young Gosselins. "Sadly, the things that are happening now, with all of this conflict and having it be so public, puts these children very much at risk for having problems," said Pedro-Carroll, author of the forthcoming book "Putting Children First: Proven Parenting Strategies for Helping Children Thrive After Divorce." "I worry about the children being pulled into loyalty conflicts, thinking about who the good person here is and who's the bad person, when children very much need two loving, responsible parents in their lives." Kessler said he advises his celebrity clients to, when possible, keep the children out of the media and receive training in cooperative parenting. Lisa Pecot-Hebert, an assistant professor at the College of Communication at DePaul University, said she believes many viewers can relate to the Gosselins' divorce drama. Fans can also view the family's situation as a cautionary tale, she said. "I think viewers can learn that sometimes when people let cameras into their personal lives for our entertainment, oftentimes it ruins what was theirs to begin with," Pecot-Hebert said.